With the explosion of various chic cupcake bakeries around town I imagine you're expecting the post where I publish my informal results of a cupcake competition. Is it Billy's or Magnolia? Crumbs or Cupcake Factory? (Yes, inevitably that post too come, . . . but at the moment I am still eating myself around town. I must carefully weigh all the options, you see). 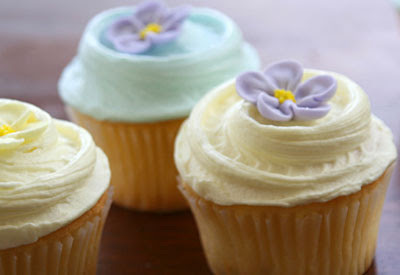 However, if you prefer to skip this tired competition all together and instead think you can make a cupcake as good as from any of these trendy cupcakeries, then I suggest you head to N.Y. Cake & Baking Dist. shop to stock up on baking supplies. The shop is filled with cake tins, decorative paper cupcake cups, frosted flowers, baking tools, candles, cake toppers, frosting dyes and glitter, silver gilded almonds, sprinkles, cake stands, wedding cake supplies and so much more. Even if you are not a seasoned baker, browsing the aisles of this shop might just inspire you to go home, remove the handbags and winter hats from your storage closet, ahem, I mean oven, and bake a cake or two. N.Y. Cake & Baking Dist. is located at 56 West 22nd Street, between 5th and 6th Aves. The service is very rude, but you might have to put up with it as this may be the only baking store in Manhattan that is this good. Just a word of warning - remember, you live in NYC, . . . your kitchen is TINY and you already use your oven as a storage closet. Don't buy too many baking supplies! why didna we go there when i was visiting? I am eager to have it. That's nice would you please tell me the recipe of it.? ?